What does the 19th floor of the Hotel Adriatika in Guatemala City, the AppHaus in Heidelberg, or RSC’s “The Other Place” have in common? They are not my office, they are an “other place”. 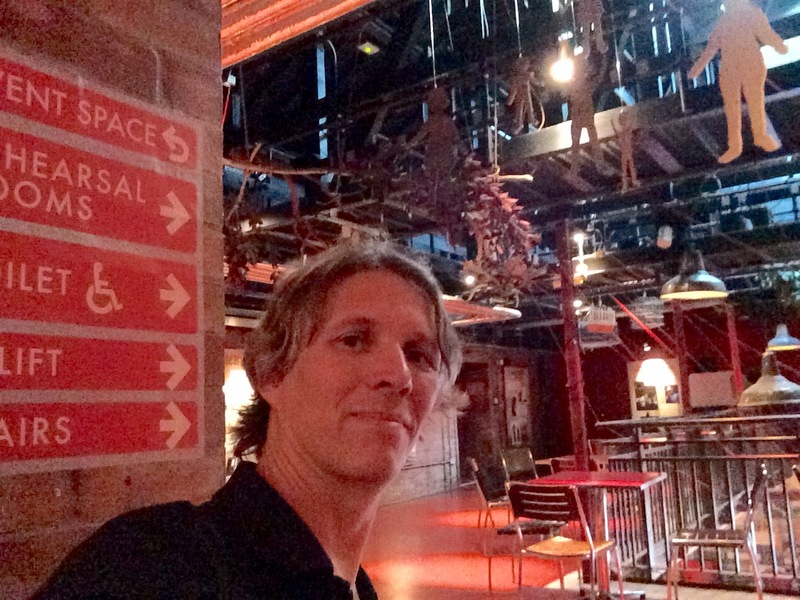 Most specifically, Royal Shakespeare Company’s “The Other Place” was created as a place for rehearsal and creativity. The RSC actors tried out new ideas and concepts here, and the place is still vibrating with energy. 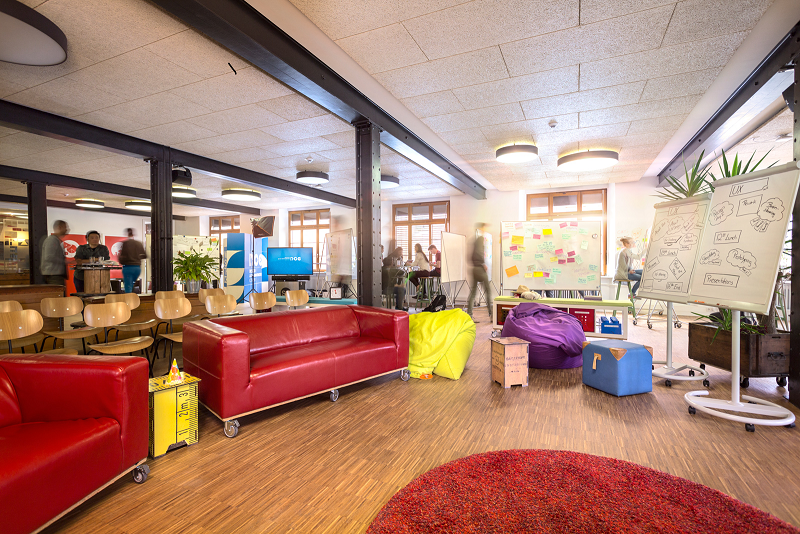 Similarly, the AppHaus is a fabulous place for design thinking and innovation. And yes, it is the space: the combination of flexible, movable furniture, adequate room for whiteboards and presentation surfaces as well as materials for prototyping design ideas. It’s very much the opposite of a cubicle, and the general atmosphere rather of a colorful playground than an office desk makes all the difference. The 19th floor of the boutique hotel Adriatika was quite opposite: just an empty room with a view, but what view! 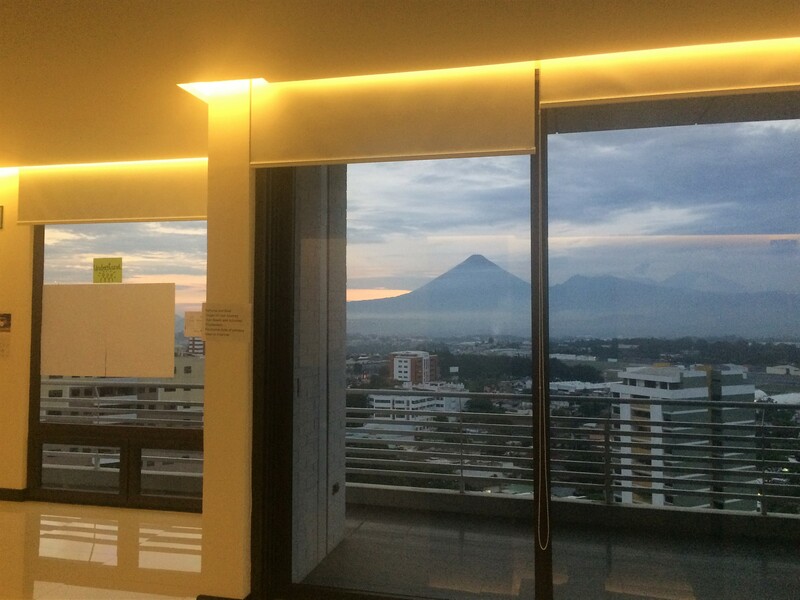 Sticking post-its on the windows facing the skyline of volcanos and beautiful Guatemala city below. My brain mode is changing in such environment – allowing for vision and crazy ideas. There is a little café in Heidelberg (with high-speed wifi), there is the 5th floor in my office building with design thinking-ish furniture (where I am somewhat off the grid) – I could continue for much longer. What is it that triggers the creative process? Sometimes it is the indistinct background chatter. Sometimes the “Weitblick” – the unobstructed view of nature and mountains. The German word “Weitblick” actually rather refers to “vision” – and that is exactly the point. In my office, I look at the next office building – if I turn my head. Where do you get into a creative mood and come up with brilliant, new ideas? Besides the place and the surroundings, there are many other factors and boundary conditions. There is an abundance of materials on design thinking. The methodology is a strong catalyst – to ensure “inspiration” is not a question of luck, but a method of working. What else? The room, check. The post-its, lots of them, check. Great coaches, check. The other key “ingredient”, in my opinion, is people. Get open-minded, innovation-hungry people, with sometimes seemingly crazy ideas together – and a miracle happens. I have seen this at startup conferences, tech-eds, during conferences (often at the bar). I love the term “the art of the possible”. When innovation happens in several domains at the same time, I long for real life examples and showcases – to experience first hand a firework of ideas. If you are looking for an upcoming such firework of ideas, to get a new perspective on innovation around topics like the internet of things, mark the upcoming SAP Leonardo Live event in your calendar. So, next week, rather skip the creative café and join us in Frankfurt/Main, Germany on July 11 – 12, 2017. Expand your horizon, adopt a few new ideas and make them yours.